Executive Chef Luke Venner, of elm restaurant in New Canaan, has a decadant and delicious Thanksgiving recipe for our CTbites readers. 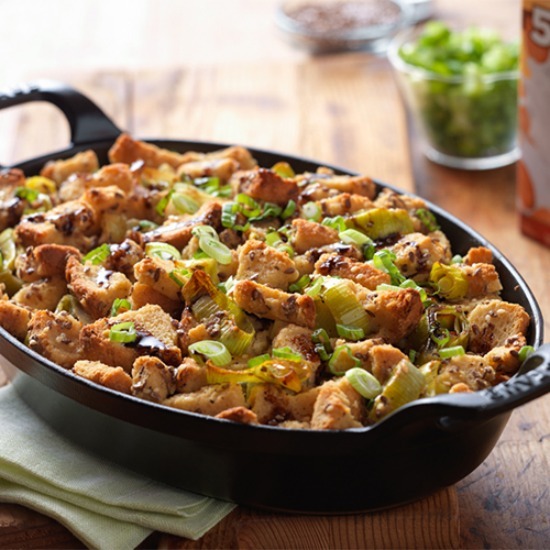 If you want to make your guests extra happy this season, go beyond traditional bread pudding with his recipe for Black Truffle & Leek Bread Pudding. We are quite certain it will elicit praise all around. Of course, personally I'd rather have Chef Venner cook it himself, but if you can't get to elm restaurant, try this recipe at home this Thanksgiving season. Your guests will thank you. Wash the leeks thoroughly in warm water. Transfer to a medium sauce pan with the black truffle butter and cover with a lid. Season the leeks with salt and cook over low heat stirring often. Add a few tablespoons of water occasionally to ensure the leeks don’t burn. Cook for 8-12 minutes until the leeks are translucent and have lost their crunch. Preheat oven to 350 degrees. Spread the pieces of brioche onto a sheet pan and toast for 12-15 minutes until golden brown. Combine eggs, cream, thyme, cheese, lemon zest, nutmeg, black pepper, and salt in a large bowl and process with a hand blender just until the eggs are fully incorporated. Add the pieces of toasted brioche to the custard and toss until the bread has absorbed some of the custard base. Add the bread pieces to a 9 x 13 in baking pan and pour the remaining liquid evenly over the top. Allow 10-15 minutes for the bread pudding to rest and return to the 350 degree oven to bake until the custard is set and the top is golden brown approximately 1 ½ hours. Grate the fresh black truffle over the warm bread pudding using a microplane.